The last Danny Boyle film I had seen was 28 Days Later, sans the follow ups. The present Blu-Ray presentation of the film which won eight Oscar is really something. The lush colours and fast visuals are thrilling, as is the lossless 5.1 DTS-HD Master Audio. I have subsequently found that the film was shot on a combination of film stock and video, explaining some of the visual disparity others have been talking about. The movie is a long-spanning love-despite-despair story involving Jamal Malik (Dev Patel, of Skins fame), his brother and a girl from their childhood. The story-telling technique is a series of Who wants to be a millionaire? questions which couch his recollections of the tough quest to exist through poverty and its brutality. The gruesome underworld is a tempting way to survive but its seduction can be deadly. The structure of Slumdog provides great flexibility, as well as a stunning panorama of the subcontinent, Taj Mahal included. I don’t like giving away any more about the story. One quandary was the “subtitles”: they’re not the discrete lines of text neatly tucked at the bottom of the screen. They float left, right, up, down around the speakers, even changing colour depending on who is speaking. I am not sure why this is the case, nor if it is only a disc “feature”. Were it also to appear on the cinematic release, I daresay it was an attempt to appear audiences who famously shy away from material not in English. I personally found annoying and distracting but it does slide nicely into Boyle’s fast-paced imagery. There quite a few features: commentary by Boyle and Patel and by writer Simon Beaufoy; deleted scenes; “Slumdog Dreams”, a making-of; and the curious Jai Ho Remix—Slumdog Cutdown, which is a condensed version of the film, comic-book style. 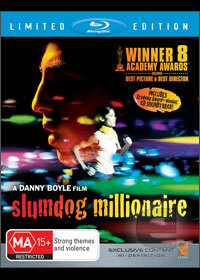 The ubiquity of Millionaire, in Australia embodied by Eddie Everywhere, means the film is familiar to everyone. Yet there are some very distancing, even very arresting scenes, right from get-go. There is constant oscillation between cruelty and levity, between harshness and tenderness: we would expect nothing less from a land as vast as India. I found the film interesting and beautiful, with some really great moments. I also thought it a tad too long though and am quite baffled by the number of Academy Awards it did end up scoring. Such, however, is the mystery of personal taste.